Wisconsin Governor Scott Walker, earlier this summer, was the front-runner among the Republican presidential candidates in Iowa. A Quinnipiac University Poll released Friday shows Walker is now in the middle of the pack with the support of just three percent of Iowa Republicans who plan to attend the caucuses. Walker, at a campaign stop Friday in Maquoketa, said he’s no stranger to the role of underdog. “I was so low in the polls four years ago in Wisconsin, Time magazine actually called me ‘Dead Man Walker.’ We didn’t change who we were, we stayed true to ourself and we went out and just showed that our reforms work,” Walker said. 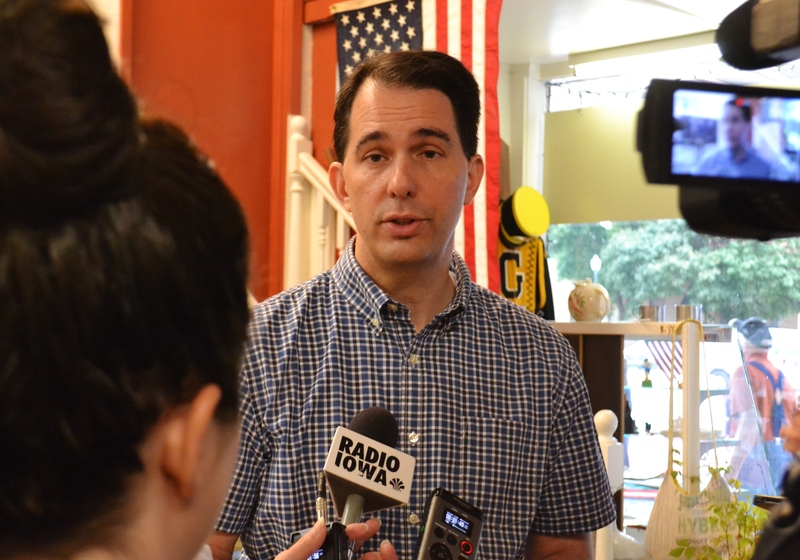 After this weekend, Walker will have visited 30 of Iowa’s 99 counties. He’s promising to visit all 99 before the February 1st Iowa Caucuses. “I think, in the end, people will see…others can talk about things, we actually have real solutions and we’ve done ’em. We’ve done them in a way that no one else has been tested. I think that’s going to be the key to our success,” Walker said. Texas Governor Rick Perry announced Friday that he’s suspending his campaign for president. Perry had quit paying all but one Iowa campaign staffer a few weeks ago. Walker said he’ll miss having Perry in the race, but he’ll also seek the backing of Perry’s supporters. “We’re going to make an appeal. I think if someone liked (Perry), a good conservative governor who actually got things done, certainly we’d be top on their list for most voters out there,” Walker said. About 30 people turned out to meet Walker on Friday during his stop at the Decker Hotel in Maquoketa.